Not totally off topic, but where do I go now to get Thief 2 fan missions? ttlg.org is for sale and southquarter.com is not working. now where do I go in between TDM missions? You can try darkfate if you want to. Use Google Translate and voila. Edited by Anderson, 05 January 2018 - 12:18 PM. There you can find pretty much every thief 2 fan mission in existence. Also I'd recommend keeping an eye out on this new site coming that will hopefully act as another FM repository. I have been using this site as my goto for T1/2/3 news, so its good to hear they are becoming another FM repo. Not ttlg.com, though. I've never visited the .org version, so I've had no idea you can get FMs there. I downloaded most of mine from Cheap Thief Missions and Southquarter. I miss the heyday of Southquarter, even if it lasted relatively briefly. I loved reading the various mission reviews there. Only 33 Thief 3 FMs. Edited by bobrpggamer, 17 January 2018 - 04:14 AM. I have the same copy, from komag right..? Exactly, but did not want to drop names (because of money being involved). I was the last one to purchase the DVDs before he closed up shop. Where is Komag anyway? other than in the same county in CA where I live. My Thief 3 FM was made possible by his tutorials, and I think Dark Mod as well. Edited by bobrpggamer, 17 January 2018 - 08:06 AM. I'm friends with Komag on Facebook and he'll sometimes post things he's up to. Pretty much it's just that he has a family now & is busy with them. Occasionally he'll let the gaming fan part of himself show a bit. I wouldn't be surprised if he sometime in the future he'd poke his head in, but I don't know if he'll be making FMs. Be cool if he did of course, but he's more than put in his time to be well remembered. (I had the idea he was in Farmington MA though.) I got Komag's DVDs, but I did it the free way by sending him blank DVDs with a SASE. Incidentally one of the most interesting projects of his to me was an unreleased map pretty much just of a tower with a bunch of rooms. It might have even been for TG, it was really early on. Instead of carving out individual rooms, normal dromed style, he actually used positive brushwork with lots of microdetail--like each wall was its own brush, with another brush for each border, etc--ending up with these winding chaotic series of tight rooms and passageways, with random stairs everywhere. It was terribly inefficient and gameplay would have been hell, but it still sticks out in my memory, the sheer organic chaos & detail of it all. I have a mind to make something like that someday, because it's a style actually kind of suited for Darkmod. I am familiar with that FM just out of curiosity but do not remember it. My praise to Komag was his amazing and somewhat comical ways of explaining things in his tutorials. Edited by bobrpggamer, 17 January 2018 - 10:16 AM. Incidently the latest really major FM to get released was Lady Rowena's posthumous "Home Sweet Home". And you can see the sites that are staying up to date by hosting it: Dark Fate, Southquarter, Thief Missions, and Taffer's Paradise. They might be missing some FMs for some periods, but they're still getting important ones. Re: Komag, I should be fair, the FM I mentioned wasn't his best or the one he'd want credit for. The Swing is phenomenal. Mind Master is something special too. It's possibly the only FM where the blue room (a room outside the playspace just for the mapper to collect all the functional entities in one place the player can't see) was bigger than the actual playspace. You could spawn yourself inside it and it was miraculous. The way he randomized the game was he'd spawn frogs inside fences of triggers, and they would hop around at random around until they hit one of the triggers. And there were all these rows and rows of doors and buttons that would trigger in a cascade of activations. And it all worked! It was really something to behold. Not to digress too deep into the weeds but I too have fond memories of Komag. I believe there's still a screenshot of a keep he built a long time ago posted on this website. It's a side-by-side comparison of the real keep and his Darkmod keep. It's some impressive work and inspired me to join these forums. At one point I asked him if he would release it for others to play but he said that it was an incomplete build. I tried convincing him to finish it but sadly I don't think he ever did. Is this still true? 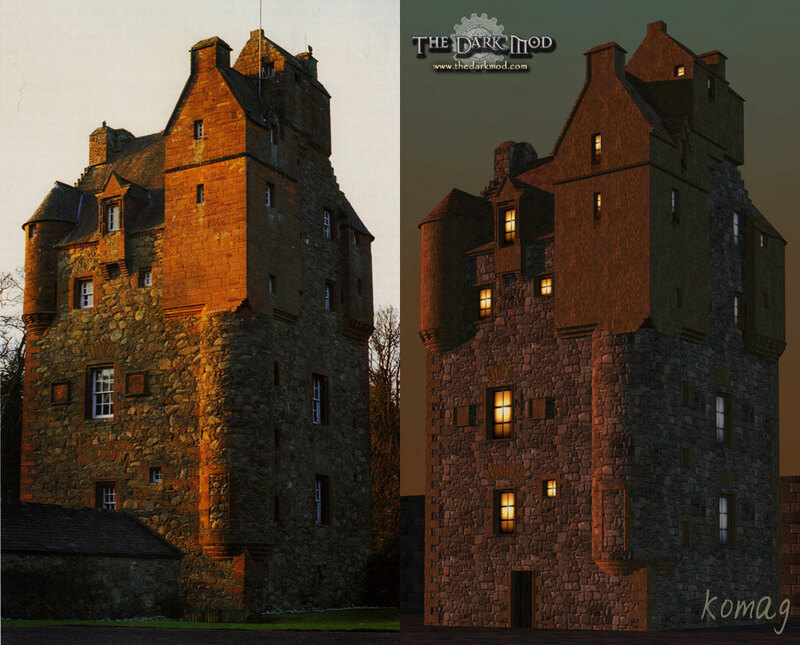 I have always wanted to build that keep with the Unreal engine just as a comparison but I don't actually know anything about the real keep. Does anyone know its name, location etc? Edited by Jetrell, 17 January 2018 - 01:31 PM. @Jetrell, I remember when Komag posted that screenshot. It was during the early days of Darkmod. Komag did a lot of building experiments just to test the capability of the game engine. I am pretty sure he never released any of his demos, but they were cool to look at. As I recall the thread with that screenshot, that building is all solid brushwork. There is no interior, and he said it would have been difficult for him to create an interior, especially for the curved brushwork (if you've ever built in DR, you'll see why). So what you see on the outside is all that it was possible to make. As for what tower it is, you can do a Google image search and it identifies it as Amisfield Tower in SW Scotland. @demagogue, thanks! It's a bummer that Komag didn't ever make an interior of that tower (completely understandable) but still, what he made is beautiful and stands the test of time which is quite an accomplishment. I was able to dig up Komag's original thread. http://forums.thedar...n-dark-radiant/ A nice bit of nostalgia there, lots of old members commenting of his work. I just Googled Amisfield Tower. It really is a fine structure and I will endeavor to do justice.